You do a lot with your labor dollars, so start telling your story. Whether you're presenting your budget in the board room or explaining your variances to the Controller, taskTracker has got you covered. We created an application that won't add work to your busy schedule, but will give you a detailed view of how labor dollars are being spent. With on-demand reporting you'll alway have the answers. 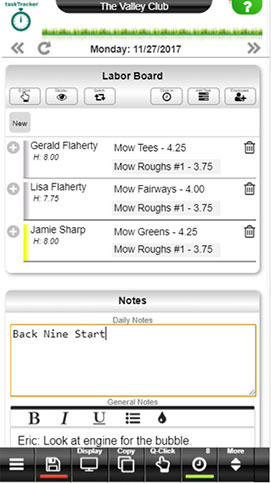 taskTracker was built by professionals in the golf industry. Our focus was to make a software that can answer the tough questions on where money is being spent without adding to your work load. Tracking labor isn't anything new, but most erase it at the end of the day. That data is valuable and can make your operation more efficient. By doing what you have always done, creating daily job boards, you can unlock the keys to a more successful operation. Develop your best practices from year to year. Set expectations that are in line with your resources. Explain ROI of equipment vs labor. Explain budget variances with a few clicks. Measure the efficiency of your staff. Communicate with your committees, staff, department heads, and general managers. Communicate effectively with staff, department heads and committees. 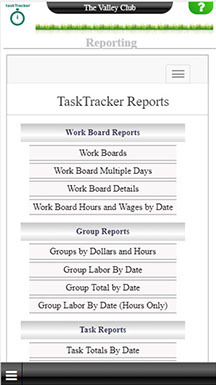 taskTracker has the power to keep you in the loop and ahead of the game. 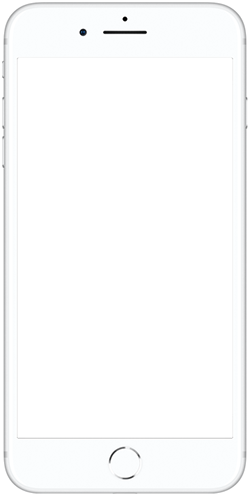 Use taskTracker's built in texting to send mass communications to your staff, or translate your employees' jobs into their native language. 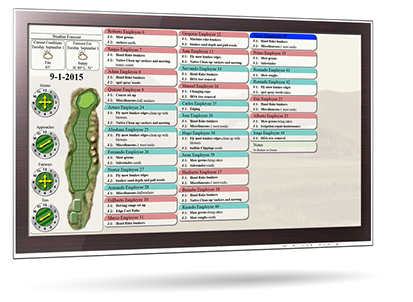 The integrated club calendar makes sure that you stay current on your club's events, and the built in reporting will demonstrate just how much you do. Every change has an affect, but to predict it you have to measure it. Budgets will change in both good and bad times, but expectations don't always change with a budget. Showing how money is being spent can help realign expectations and communicate how much labor is being spent on each area of your course. You will be up and running in no time with the intuitive dashboard that will have you assigning tasks in minutes. With a cloud based design, your information is always with you, whether it's at work, at home or on the go. taskTracker keeps you in the loop and allows you to communicate effectively to your staff, department heads and players. 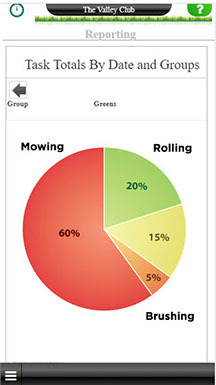 Easy one click reporting will give you all of the data you need to make the right decision. You’ll be up and running in a few minutes. taskTracker is the fastest growing labor management software in the industry for a reason--It’s a faster, easier way to run a golf operation. A 30‑minute demo is all it takes to see for yourself.